Martin Zwick, the wine blogger from Berlin, is rapidly building up a reputation as being a mover and shaker in the German wine scene. This is due to the various Berlin Cups that he is organizing. It all started with the BerlinRieslingCup a few years ago, a blind tasting and ranking in November of what Martin Zwick considered the leading Grosses Gewächs wines - the ultra-premium dry wines of the VDP producers, Germany’s elite wine makers - that were released on September 1 of the same year. Initially, people did not pay much attention to the BerlinRieslingCup, but this has clearly changed over the years. But the BerlinCup is no longer just about Grosses Gewächs wines, Martin has added a (1) BerlinGutsweinCup – ranking entry level wines, a (2) BerlinKabinettCup – ranking lightly sweet wines at the Kabinett level and a (3) BerlinSpätburgunderCup – ranking German Pinot Noir wines. Picture: At Weingut Schnaitmann with Rainer Schnaitmann during the Germany-East Wine and Art Tour by ombiasy WineTours (2015) The 2013 Schnaitmann, Fellbacher "Lämmler" GG, Spätburgunder, Württemberg was #2 in the BerlinSpätburgunderCup 2013/2015. There is a red wine revolution going on in Germany and the world increasingly takes note of it. Of course, given its location, the red wines of Germany tend to be not like the fruity red wines we know from warmer countries, but lean and more elegant, with a lot of finesse. 30 years ago, the share of red wine in total German wine output was not more than 10 percent; in the international wine scene, people would not talk about German red wine. But this is changing. Germany now produces red wines that can compete with the best of the world; the share of red wines in terms of production has increased to about 35 percent now in Germany and increasingly the international market takes note of what is happening in Germany. Picture: Paul Fürst, Annette Schiller, Sebastian Fürst and Christian Schiller at Weingut Rudolf Fürst: Tasting and Tour with the Pinot Noir Legend Paul Fürst, Weingut Rudolf Fürst in Bürgstadt, Franken – Germany-East Tour by ombiasy WineTours (2015). The 2013 Fürst, "Hundsrück" GG, Spätburgunder, Franken was #3 in the BerlinSpätburgunderCup 2013/2015. Today, Germany is the third biggest producer of Pinot Noir (called Spaetburgunder in Germany), after France and the US, with more planted than Australia and New Zealand combined. However, despite being the world’s third largest producer of Pinot Noir, the country exports just over 1% of its production. Picture: At Weingut Bernhard Huber with Julian Huber during: Germany-South Tour by ombiasy WineTours (2015). The 2013 Weingut Berhard Huber, Malterdinger Bienenberg Wildenstein GG, Spätburgunder, Baden, was #4 in the BerlinSpätburgunderCup 2013/2015. The BerlinSpätburgunderCup 2013/2015 took place in late October 2015. Tasted and ranked were wines from 2013. A group of sommeliers, wine retailers, wine bloggers, wine marketing people and Pinot Noir lovers tasted and ranked 39 wines. These were all ultra-premium wines, but not only VDP.Grosses Gewaechs wines. Michael Quentel was one of the judges and published his tasting notes and general impressions on his website (in German). I selected a few (including of the most expensive wines) and re-issued them here. The pictures are mine. The Germany-North Tour by ombiasy WineTours (2015), organized and led by Annette Schiller, took place from September 6 – 12, 2015. The group was small - there were 7 of us, including Annette and Christian Schiller. The tour took us to the Rheingau, Mittelrhein, Ahr, Mosel and Nahe. In the Ahr, we visited 2 producers: Adeneuer and Meyer Näkel. This posting cover the visit of Weingut Adeneuer. Marc Adeneuer was our host. With only 558 hectares the Ahr region is one of smaller of Germany's 13 regions. Despite its northern location (it is for example situated north of Mosel region) it primarily (almost 90%) produces red wines. It is believed that vines were cultivated in the Ahr valley already in Roman times, as is the case with nearby Mosel. The narrow Ahr river valley is responsible for the region's favored mesoclimate. Situated between 50° and 51° north, Ahr is the world's most northern region dominated by red wine grapes. So far north, very good sites with a warm microclimate are needed to properly ripen red wine grapes, and the Ahr vineyards are said to have a "Mediterranean" microclimate. Most vineyards are located on terraced slopes facing southwest to southeast along the middle and lower portions of river Ahr, over a stretch of 25 kilometers. Spätburgunder is the dominant grape variety of the Ahr wine region. Weingut J.J. Adeneuer in Bad Neuenahr-Ahrweiler in the Ahr Valley is a family-owned winery with 500 years of history. In 1984, the brothers Frank and Marc took over the operation from their aunt. Frank is the winemaker and Marc is the administrator/sales man. The vineyards total 9 hectares: Rosenthal (Ahrweiler), Burggarten and Landskrone (Heimersheim), Schieferlay and Sonnenberg (Neuenahr), as well as Domlay and Gärkammer (Walporzheim). Spätburgunder accounts for 80 percent of the wine portfolio. In retrospect, it was the right decision for the brothers Frank and Marc Adeneuer to concentrate on Spätburgunder. They say: "At the end of the day, Pinot Noir is always good for a surprise and therefore, it requires more attention." They are the sole owners of the renowned, spectacular site Walporzheimer Gärkammer, between Kräuterberg and Pfaffenberg. It is one of the smallest single vineyards in Germany. The Adeneuer family acquired the vineyard in 1714. The wines are individually produced in oak casks and kept strictly separated according to grape variety and site. The wines are made in big old barrels, with the exception of some of the top cuvees which see new oak. The latter are the #1 wines. The top wines age for 18 to 24 months in new oak. For the Adeneuer brothers, terroir is not just a trendy word, but rather "the soul of our wines." Weingut Adeneuer has 4 (of 5) grapes in the Gault and Millau WeinGuide Deutschland and 3,5 (of 5) stars in the Eichelmann. Mark Adeneuer: Vintage 2014 as very difficult and a lot of sorting was needed. The results are very interesting. Vintage 2013 was good, it was not too warm. The wines have good structure and acidity. Fruit and tannins are very well balanced. Thank you very much Marc for a great tasting. After the tasting, we checked in at Hotel Ännchen in Bad Neuenahr-Ahrweiler, a 3 star family run hotel within the medieval town walls in Ahrweiler on the pedestrian precinct. We had dinner in the medieval Old Town and tried some more fine Ahr wines. Fall Tours by ombiasy WineTours 2015 - A Very Special Treat: Experience Harvest Time ! 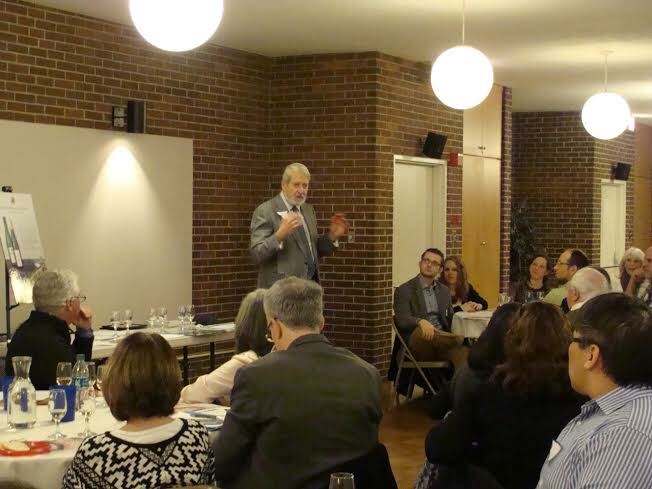 On the evening of November 20, 2015, the Capital Chapter of the German Wine Society in Washington, D.C. had the pleasure of hosting representatives of Weingut Richard Böcking at Harbour Square, and tasting a broad selection of ten wines from their portfolio. Owner and Managing Partner W. Denman Zirkle, and his daughter Sigrid Zirkle Carroll, Director of North American Marketing, presented the wines, aided by Ann Sweeney Zirkle, Denman’s wife. 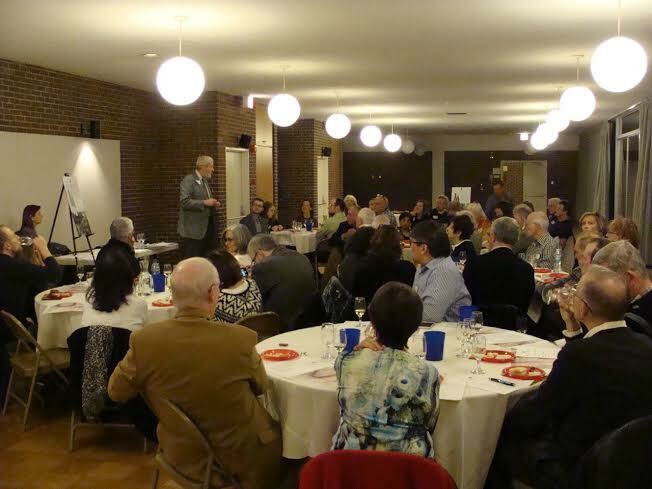 This was a very enjoyable as well as educational event, and well attended with 46 members and guests. 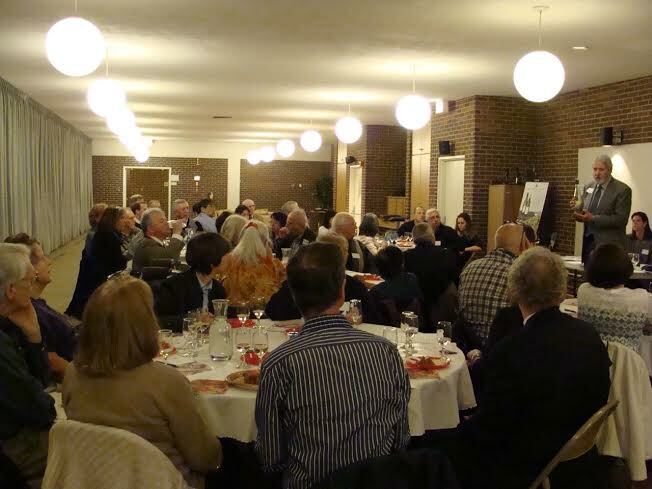 Mr. Zirkle commented afterward on how knowledgeable and interested the members of the German Wine Society were. 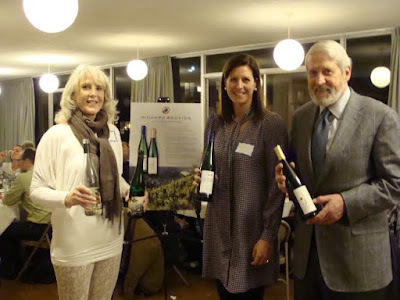 I had met Mr. Zirkle and his wife at Christian Schiller’s Summer of Riesling event in August 2015 (see: Annual Riesling Party at the Schiller Residence in Washington DC, USA 2015), and as President of the Capital Chapter of the GWS, quickly invited them to organize a tasting event for our group. About half of the wines were obtained from distributors in the Northern Virginia/Washington D.C. area, while the rest were brought directly from the estate in Germany for the event. The Richard Böcking estate, located in Traben-Trarbach along one of the great loops of the Mittelmosel, is one of the most ancient in the region, with a history dating back to 1623-24. It consists of five vineyards (einzellagen), the Burgberg, Schlossberg, Ungsberg, Hühnerberg, and Taubenhaus, the first four of which have traditionally been considered Grand Cru sites, with the steep slate slopes characteristic of the Mosel. 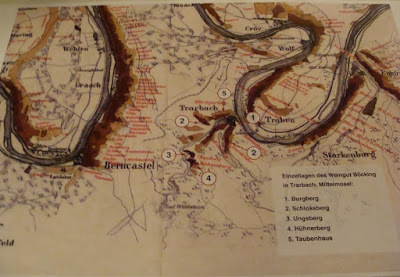 Notably, the vineyards do not front directly on the Mosel, but are in two side valleys leading into the Mosel, the Schottbachtal and Kautenbachtal, on the Trarbach side of the river. These valleys, like the Mosel itself, provide the warm climate and south or east facing slopes needed for creation of fine Rieslings. Cultivation of grapes here dates back to Roman times, and the Böcking family was once one of the wealthiest in the Mosel, serving as regional treasurers for the Prince of Palatinate-Zweibrücken. Indeed, their estate even hosted the famed poet von Goethe in 1792. The seat of the winery today is the 14th century stone Rittersaal (Knights’ Hall), the largest secular building from the Middle Ages remaining in the Mosel, originally built as a wine cellar for Grevenburg Castle. Recorded cultivation at the Ungsberg, the oldest of the vineyards with extremely steep slopes of grey, blue and brown slate mixed with quartz, dates back 400 years, and these vineyards were planted with 50% or more Riesling grapes well before this became characteristic of the entire Mosel. But at the beginning of the 20th century, after ten successful generations, the family began to decline, with the estate passing between various cousins, and some vineyards lost, though the family kept the Trarbach properties. 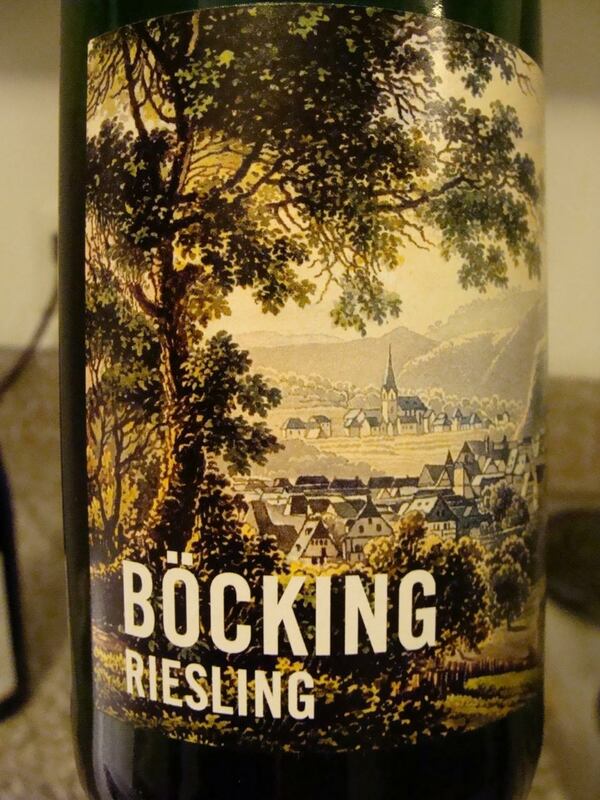 In 2010 the Böcking family faced a decision whether to sell the remaining vineyards, or attempt to revive the estate. Fortunately, they chose the latter, and under the leadership of Mr. Zirkle, Baroness Leweke von Marschall and her cousin Sigrid Carroll, who are both descendants of the Böcking family, and winemaker Simon Trös, the estate has begun to recover. Learning the German wine culture and legal environment has posed a particular challenge for Mr. Zirkle, who is American, though connected to the Böcking family from his first marriage through his late wife Dagmar von Maltzahn. 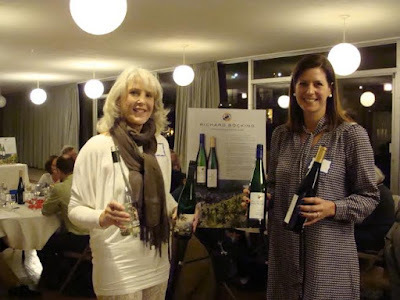 Ms. Carroll, born in Germany, was also raised and educated in the United States, though she worked in the family vineyards in Germany as a teenager, learning the winemaking business. Since 2010, Weingut Richard Böcking has doubled its area under cultivation to 6 hectares (about 15 acres), and has plans to double this again. The estate produced its first new vintages in 2012, and at this event German Wine Society members and guests were able to sample wines from three different years. 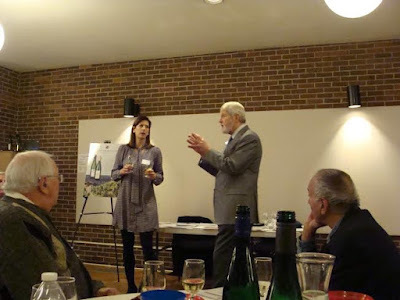 During the tasting, Denman Zirkle and Sigrid Carroll explained their estate’s philosophy of relying on ungrafted old vines (alte reben), over 40 years in age, in most of the vineyards. The Böcking properties are planted overwhelmingly with Riesling, though some have 10% Spätburgunder (Pinot Noir). Almost all the wines we had during the tasting were Rieslings, with one Pinot Blanc (Weissburgunder). For most of the wines the Böcking estate produces, the goal is expressed by a German term, “geschmacklich trocken”, referring to wines that are in the range of dry (trocken) to half-dry (halbtrocken or feinherb). This is very consistent with the current trends and tastes among German consumers today, and about 60% of the estate’s production is consumed in Germany, with 40% exported. 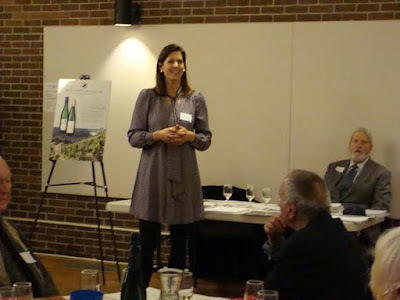 U.S. distributors for these wines are found in the New York/New Jersey area, the Northern Virginia/Washington, D.C. area, and Montana, where Sigrid Carroll resides. 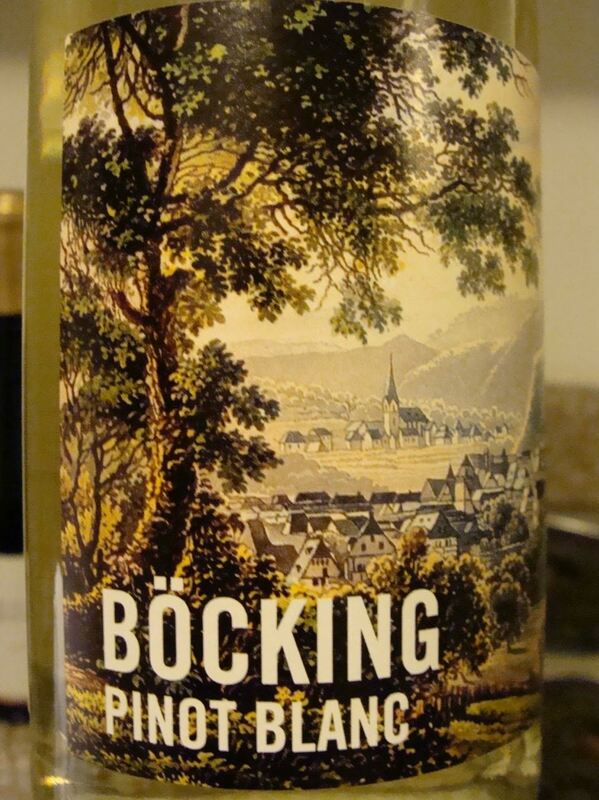 The Böcking estate does, however, produce some wines that have more of the sweeter Riesling style and prädikat classifications, under their “M” label. We tried two of these during the tasting, a Kabinett and a Spätlese, and were interested to learn that the estate has now produced some Auslese as well and has been working on a Beerenauslese. Though we have diverse tastes in the German Wine Society, I had warned Mr Zirkle, as he noted during the tasting, that many of our members prefer the sweeter wines (which we think of as traditional now, though that is not necessarily true going further back in German wine history). But he, like the knight RichHeart that he uses as a symbol for some of his wines, bravely ventured into the lion’s den of sweet wine lovers, and was able to give us a very pleasant evening that nonetheless reflected the modern direction in German wines. Our first flight of wines consisted of two young wines under the RichHeart label, the 2014 RichHeart Pinot Blanc (Weissburgunder) and 2014 RichHeart Riesling, both bottled in the spring of 2015. These have some of the most attractive labels I have seen in decades of enjoying German wines, with paintings of the Traben-Trarbach area on the Mosel. 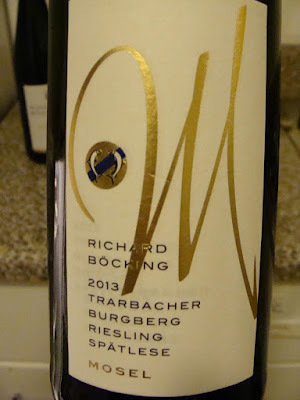 The RichHeart wines, Mr. Zirkle explained, are not produced using grapes from the estate’s own traditional steep slope vineyards, but use grapes from other producers in the Middle Mosel. This has allowed the estate to expand its production considerably, with 10,000 bottles being produced in 2014 under the RichHeart label, while a total of 14,000 were produced from the various vineyards of the estate, limited by weather conditions in the Mosel. These dry to off-dry wines are fresh and fruity, though uncomplicated, with apple and pear aromas in the Weissburgunder. 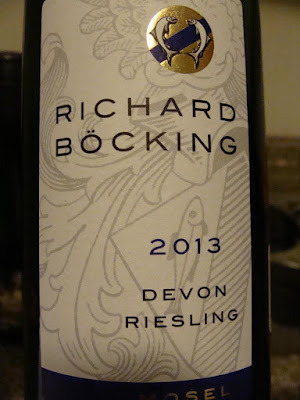 Next, we tried two wines the estate produces under the Devon name, a 2013 Devon Riesling and a 2014 Devon Riesling. The Devon name refers to the Devonian-era soil of the vineyards, and these wines are produced mostly from grapes cultivated in the estate’s Trarbacher Traubenhaus vineyards, though some of the grapes come from the estate’s Grand Cru vineyards. These are considered entry-level wines by the Böcking estate, with less complexity than the Grand Cru wines. The success of the first 2012 production of these wines, which was sold out by 2014, confirmed the estate’s decision to focus on light, drier Rieslings. There were noticeable differences between the 2013 and 2014 Devon wines in our tasting, though both could be paired well with holiday dinners. The 2013 Devon Riesling, bottled in May 2014, is described as having animating acidity, fine minerality and hints of green herbs, and has 10.5% residual alcohol, with 9 g/l of residual sugar. These wines are recommended to drink young. Now we progressed to the various Alte Reben wines produced by the top Grand Cru vineyards of the Böcking estate. These next two flights were separated by year, with the first two wines 2012s, and the next two 2014s, giving us an opportunity to see how the wines mature, as well as to experience three different estate vineyards, the Ungsberg, the Burgberg, and the Schlossberg. The first Alte Reben flight included at 2012 Trarbacher Burgberg Alte Reben Riesling, and a 2012 Trarbacher Ungsberg Alte Reben Riesling. 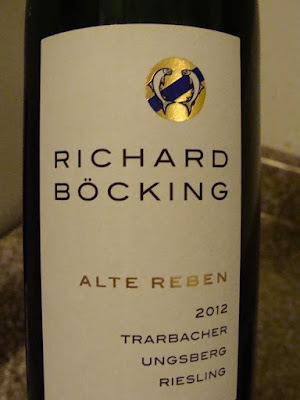 The second Alte Reben flight consisted of a 2014 Trarbacher Ungsberg Alte Reben Riesling, and a 2014 Trarbacher Schlossberg Alte Reben Riesling. 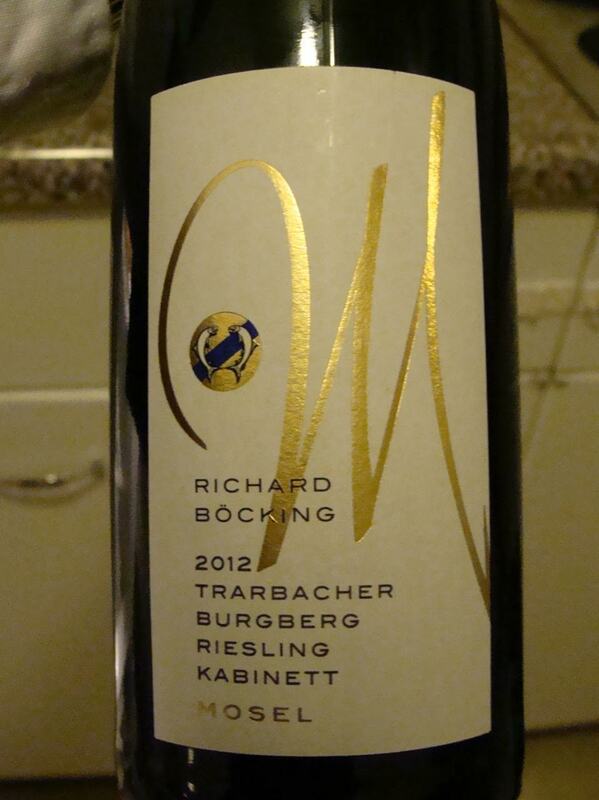 The 2012 Ungsberg, a good representative of these wines selling at $35/bottle, has 12% alcohol and 10.8 g/l residual sugar, and was harvested in November 2012 after the first frost and bottled in July 2013. 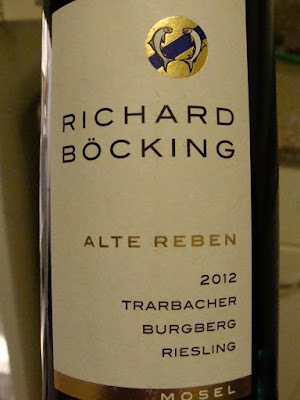 Those looking for these wines in the United States should note that the Alte Reben designation may not appear on the label here, as some local distributors prefer not to have it, though it is always found on these wines when sold in the E.U. All of these wines appear to have ageing potential. The Ungsberg is perhaps the finest Grand Cru vineyard of the Böcking estate, with vines over 40 years old, producing Rieslings with a notable spiciness as well as minerality, yellow fruit aromas and delicate acidity from its mixed slate soil and very steep slopes in the Kautenbachtal. Notes of camomile and saffron can be detected. Indeed, the name of the vineyard, though of uncertain origin, harks back to the Roman-Celtic period and the healing and salve herbs growing on the slopes here. The Burgberg, lying directly below the medieval Grevenburg Castle in Trarbach, also is among the best vineyard sites in the estate, characterized by blue and gray slate as well as quartz, with ungrafted Riesling vines over 75 years old, allowing for very complex wines to be produced. Finally, the steep Schlossberg high above Trarbach, likewise characterized by blue and grey brittle slate and quartz, adjoins the Burgberg and has some of the most ancient vines in the estate, over 80 years old. An old Roman road, still intact, runs through this vineyard, attesting to the long importance this wine-growing area has had. Finally we came to the estate’s prädikat wines, sampling a 2012 “M” Trarbacher Burgberg Kabinett Riesling, and a 2013 “M” Trarbacher Burgberg Spätlese Riesling. The “M” is a tribute to Baroness Leweke von Marschall, who has played a leading role in reawakening this slumbering estate. The “M” wines are notably sweeter than the others, fruity and late-harvested, the 2012 displaying tastes of citrus fruits such as oranges and mandarins. The Kabinett, bottled in July 2013, has only 9% alcohol, with 90 g/l of residual sugar, while the Spätlese, bottled in August 2014, has 11% alcohol and only 37 g/l of residual sugar. Both of these wines have extended ageing potential, and in discussing them with Mr. Zirkle, he acknowledged that the estate might do better to let them mature even further before serving at tastings like this to show their full potential, though I thought that the Kabinett at least was showing a good deal of its potential already. It is intense, with upfront fruit and notes of honey and citrus, and distinct minerality. Indeed, the Kabinett was my favorite wine of the evening (I confess to falling more in the sweet wines camp), as it was for a number of others at the event, and we were not the only ones who liked it. This wine was distinguished at the January 2015 SAKURA competition in Japan with the prized “Double Gold” award, the only German wine there to win the highest distinction, and yet is surprisingly reasonable in price at $25/bottle. Evidently, whatever the direction of wine tastes in Germany, there is still a welcome home for such well-produced sweeter Rieslings in the Far East and in America. 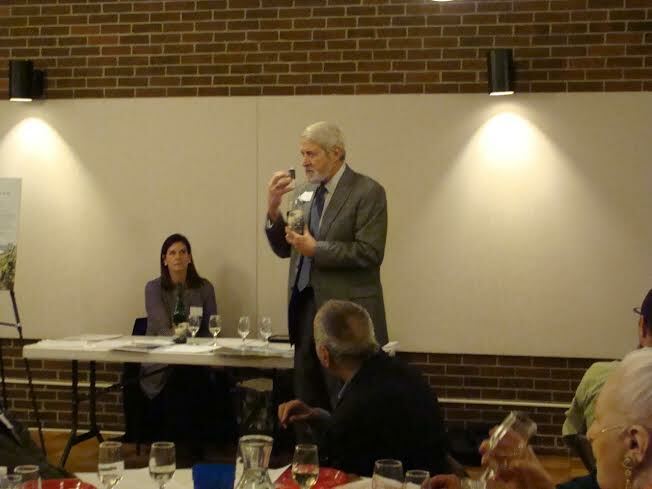 During the tasting, Mr. Zirkle was asked about the voluntary organization of top German wine growers, the VDP. He explained that membership in the VPD is by invitation. The Böcking estate, with only three years of production under its current management, has not yet been invited to join, though he hoped that it would be. Based on our wonderful evening with the wines of this estate, I thought that the estate’s prospects looked bright, and also hope that they will earn the invitation to VDP membership. 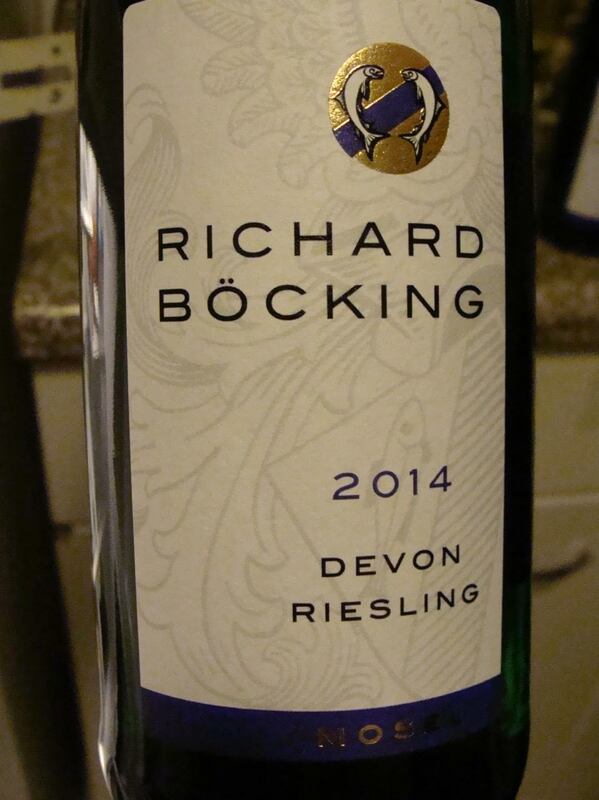 The Böcking name is coming to be known again in the world of German wines! Würzburg in Franken boasts 3 legendary wineries, Juliuspital, Bürgerspital and Staatlicher Hofkeller, with a long and most interesting history. They are also rather large (by German standards). Two of the three, Juliusspital and Bürgerspital, also house iconic wine taverns. While the third, Staatlicher Hofkeller, also has a wine tavern, but it lacks the specialness that the other two display. The posting focuses on the Bürgerspital and the Juliusspital; it also includes a few other interesting wine places in Würzburg. Spital is an archaic term formerly used to mean “hospital” in German and makes up part of the name of the other two big Würzburg wine estates. The Bürgerspital and the Juliusspital were both once hospitals. One of them, the Juliusspital, is still one today. Funding for the hospitals came from wine produced from donated vineyards. On the 23rd of June, in the year 1319, Johann von Steren established the Bürgerspital zum Heilige Geist to care for the sick and needy citizens of Würzburg. At the same time, he designated certain of his vineyards to provide the necessary financial support. A couple of centuries later, Prince Bishop Julius Echter followed suit and founded the Juliusspital with the same general goals in mind and a similar motivation: to acquire divine salvation through the mortal and the eternal through the transient. Today these two institutions are among the oldest and largest wine estates in Germany, with 140 and 170 hectares respectively, and still provide the major source of income for their charities. This city of 130,000, nestled among vineyards along the river banks, is arguably the finest of Germany's Baroque and Rococo towns. Its history dates from the 8th century, when Frankish dukes, converted to Christianity by Irish missionary monks, laid the foundations of massive Marienberg Fortress on the crest of the highest of Würzburg's many terraced and vine-covered hills. One of the oldest churches in the country, the Marienkirche, consecrated in 706, still stands in that castle's courtyard. From the Middle Ages until 1802, when Napoleon reshaped the map of Europe, imposed secularization and ceded the city to the newly created Kingdom of Bavaria, Würzburg was a rich, influential and virtually independent prince-bishopric whose rulers enjoyed both ecclesiastical and worldly powers. Most important though, nearly all those prince-bishops were connoisseurs and patrons of the arts. Their sponsorship and commissions attracted great artists and architects, who made the city the major cultural center that it is today. Thus it was Würzburg where the painter Matthias Grünewald was born and did some of his earliest work as an apprentice to local masters. In 1483, during the reign of Prince-Bishop Rudolf von Scherenberg, Tilman Riemenschneider, the greatest of the Renaissance woodcarvers and sculptors, settled and established his studio in Würzburg, ultimately becoming the city's burgomaster. His work is omnipresent in Würzburg churches and in those of nearby towns and villages. Two other prince-bishops hired Balthasar Neumann, Germany's preeminent Baroque architect, to build the Residenz, their diocesal palace, and commissioned Venetian artist Giovanni Battista Tiepolo to decorate it with Rococo ceiling and wall frescoes. To be sure, a great deal of what you see in Würzburg today is not what you think it is or what it purports to be, for much of what looks old is relatively new. Most of the city's architectural heritage was destroyed in a single World War II air raid in March 1945. But visitors today will hardly notice, for many beautiful churches, graceful bridges, ornate patrician houses and splendid hospices were rebuilt. Würzburg's most dazzling piece of architecture, and the one for which it is on UNESCO's list, is the Residenz, the palace of the prince-bishops, one of the largest and most richly decorated chateaus in all Europe. Its sponsor was Johann Philip von Schönborn, who was elected prince-bishop in 1719. The Residenz’ mind-boggling centerpiece is the grand staircase, capped by Tiepolo's 7,000-square-foot ceiling fresco. The vaulted ceiling is more than 17 feet high and is entirely unsupported by pillars. Once you have traversed the rooms and parlors of the Residenz, be certain to visit the Staatliche Hofkellerei Würzburg. The extensive and labyrinthine wine cellars stretch out deep below the building. The Staatliche Hofkeller Würzburg is one of Germany’s largest wine estates. Founded in 1128, it is also one of the oldest. Initially, it was owned by the Prince-Bishops of Würzburg. From 1814 onwards, after the Vienna Congress, the Kingdom of Bavaria was the owner under the name Königlich Bayerischer Hofkeller (royal Bavarian state cellar), with an interlude from 1806 to 1814, when it was owned by Grand Duke Ferdinand of Tuscany. After the revolution of 1918, the Kingdom of Bavaria became part of the Weimar Republic as the State of Bavaria and the State of Bavaria took over the Staatliche Hofkellerei Würzburg as the successor of the Kingdom of Bavaria. Today, the vineyard area totals 120 hectares. These holdings are spread over many communes. The first vineyards of the Bürgerspital were planted in the 1300s and served to supply the Bürgerspital’s own needs. It is reported that in 1598, the residents of the old people's home were provided with a tankard - 1.22 litres - of wine. Today, the vineyard area of Weingut Bürgerspital totals 120 hectares, of which about 80 hectares are located in Würzburg. Sites: Würzburger Stein, Würzburger Stein-Harfe, Würzburger Innere Leiste, Würzburger Pfaffenberg, Würzburger Abtsleite, Randersackerer Teufelskeller, Randersackerer Pfülben, Randersackerer Marsberg, Veitshöchheimer Sonnenschein. In Bürgerspital's old "Pfründner" cellar, there are modern stainless-steel tanks where the wines ferment temperature-controlled. In the adjacent vaults is one of Germany's biggest wooden barrel cellars: 200 valuable oak barrels, some of them adorned with precious carvings were used for cultivating wine hundreds of years ago. There is space for four annual harvests in the cellars. The iconic Bürgerspital tavern -- with its 10 rustically furnished rooms and a retail store -- is in a wing of this institution. The food is regional and the wines are those of Weingut Bürgerspital. The last time I ate their I had steak tartare. Weingut Juliusspital is Germany’s second largest winery with 177 hectares under vines. At the center of the Juliusspital Foundation are a hospital, an assisted living home for elderly people and a hospice. This has been so for more than 400 years. Today, the buildings of the Juliusspital Foundation comprise many modern buildings but also very impressive and well maintained historical buildings. As to the latter, the Fürstenbau, a palatial building, designed by the architect Antonio Petrini built in the Barock style with its historical cellar vaults, its garden pavilion and the fountain statues of Jacob van der Auvera, make the Juliusspital a unique monument of art and culture at the heart of the city of Würzburg. The historical cellars, which we had the opportunity to visit, with the old traditional wooden casks, are still in use for fermentation and aging. Since its establishment, the profits of the Weingut Juliusspital have contributed to the financing of the social services of the Juliusspital Foundation. In addition to the vineyard land, the Juliusspital Foundation also owns farm land and forests. The iconic Juliusspital tavern is part of the Juliusspital complex. It is large. The food is similar to the food at the Bürgerspital tavern. The wines are those of Weingut Bürgerspital. The last time I ate their I had “Nürnberger Bratwürste”. You will not find a wine estate at the Alte Mainbrücke, a stunning 500-year-old stone bridge, but you will find—especially on a sunny day—hundreds of wine drinkers. The bridge crosses the River Main and motor traffic is banned. It has become quite common for the Würzburg citizens, as well as visitors, to stroll across bridge, relax against one of its balustrades, sip a glass of wine and enjoy the amazing view. On the left bank, you will see the imposing fortress—Festung Marienberg—standing guard over the city from and the Käppele, a beautiful baroque chapel. Along the steep banks of the Main, you can make out the Würzburger Stein. Where do you get your wine? Weinbistro Mainwein on the Alte Mainbrücke is an outlet of the GWF co-operative (Winzergemeinschaft Franken). The GWF has 2270 members. The vineyard area totals 1321 hectares. You can purchase wine by the bottle or by the glass. Alte Mainmühle: Although this is also a nice restaurant, where it is necessary to make a reservation, you can have a snack and wine for takeout at the bar. Reisers am Stein is part of Weingut am Stein Ludwig Knoll, right in the middle of the Würzburger Stein, the biggest single vineyard in Franconia. Along with the Staatliche Hofkeller, the Bürgerspital and the Juliusspital, Weingut am Stein Ludwig Knoll owns parcels of the Würzburger Stein.